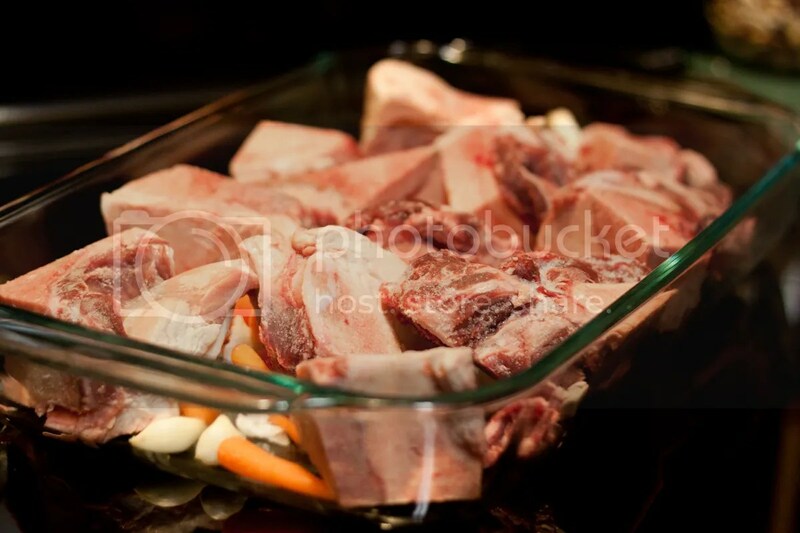 Many stores or butcher shops have beef marrow bones on the cheap, which make a dense and highly nutritious stock and excellent soup base. Although I’ve made my own stock using oxtails I’ve been wanting to try my hand at other soups, so marrow bones seemed like the best starting spot. Before we dive into this recipe, let’s have a quick culinary lesson. 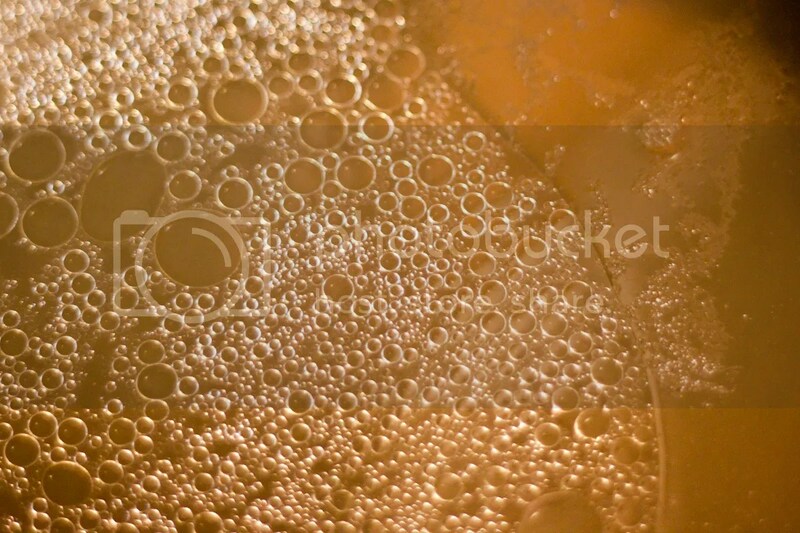 “Stock” refers to a liquid that’s made from simmering bones, and “broth” is made from meat. You can use both, and as far as I know that’s still referred to as “stock”. Now that we have that cleared up, let’s make some food. I should note that we were out of celery when making this recipe, so I’m lacking in that department. Preheat the oven to 400 degrees, and place the bones, garlic and veggies in a roasting pan that’s lined with the coconut oil. 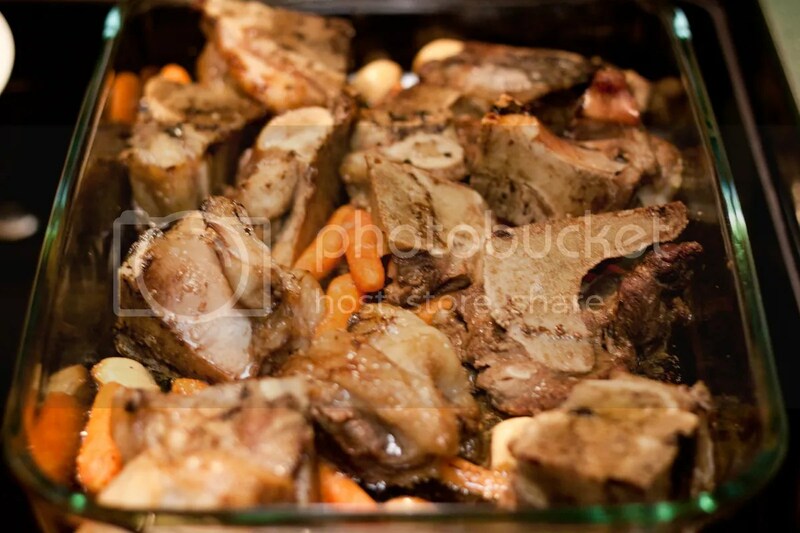 Roast the bones in the oven for about 45 minutes, flipping the bones after about 30 minutes. Take the nicely-browned chunks and add them to a pot. If there are any pieces stuck to the bottom of the pan (there’s shouldn’t be, thanks to the coconut oil), scrape them up and add them to the pot. Add the bay leaves, peppercorns, and parsley. Fill the pot with enough water to cover the bones with an inch of water. Bring the stove to medium heat. When the water shows its first signs of starting to boil, reduce the heat to low and gently simmer for at least 6 hours without stirring. The longer you simmer, the more potent and reduced your stock will be – you can even simmer it for 24 hours if you’d like. You don’t want to bring it to a boil at any time – a slow simmer is best. 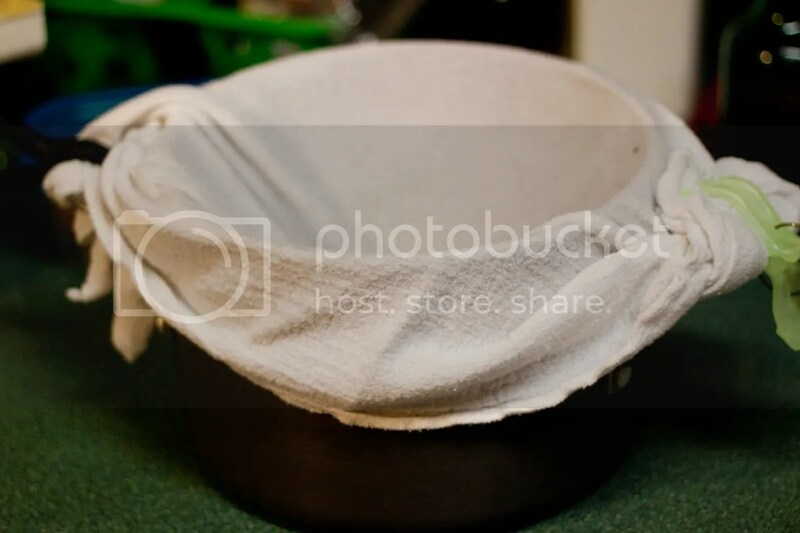 Take a different pot and place a colander over it, and then a cheese cloth over the colander. Pour everything into the colander and let it drain for 10 minutes. You should get a clear, beautiful beef stock. Pour it into some mason jars and let it cool before putting it in the fridge. As a word of warning, straight bone stock smells and tastes unlike what you might expect. This is normal, and your soups will still turn out great. If you want a more traditional, “beefy” taste from the outset, you can add some beef chunks with the bones. it’s a fairly pungent smell, but tastes great. my first thought was that it was a bit rancid, but that’s just how roasted and simmered bones smell. once you mix it with beef pieces or dilute it in water that smell goes away. Russ, thanks for sharing this and the beef jerky on chowstalker! I’m actually going to try slicing some pork side with my food processor after seeing your video! Hi Patty, I love chowstalker. It’s a great concept. I would suggest freezing the pork side for 10-20 minutes before slicing to get a more even slice. Good luck! Thanks Russ! I’ll be sure to do that with the side, and let you know how it goes. And BTW, that’s a good looking boy I see around your blog! Great recipe. thanks. But I’m wondering what the difference is between putting the veggies and bones and meat directly into the pot rather than roasting first. Russ, can you tell me — if I eat the marrow from bones I’ve used to make broth, then are the bones still okay to use again? I mean, will they give the same goodness to the next broth? Thanks for the PHD recipe! 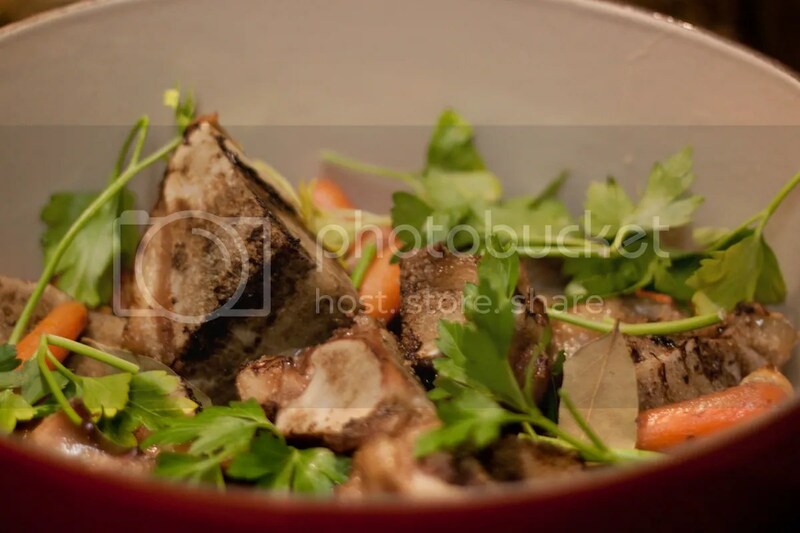 Does your bone stock gel when refrigerated, when you don’t use meat as well as marrow bones? It definitely gels when refrigerated, depending on how concentrated the stock is. The batch in this post was only simmered for about six hours, so it was mostly liquid; lately I’ve been simmering for 12+ and it gets pretty thick when cooled (and a bit darker). I’ve been storing the jars in the freezer and then running hot water over the jar until it’s thawed enough for the frozen block to slide out. I’m making some stock currently. I wondered about the smell myself. Thanks for clearing that up. Do you scrape the marrow out into your stock? 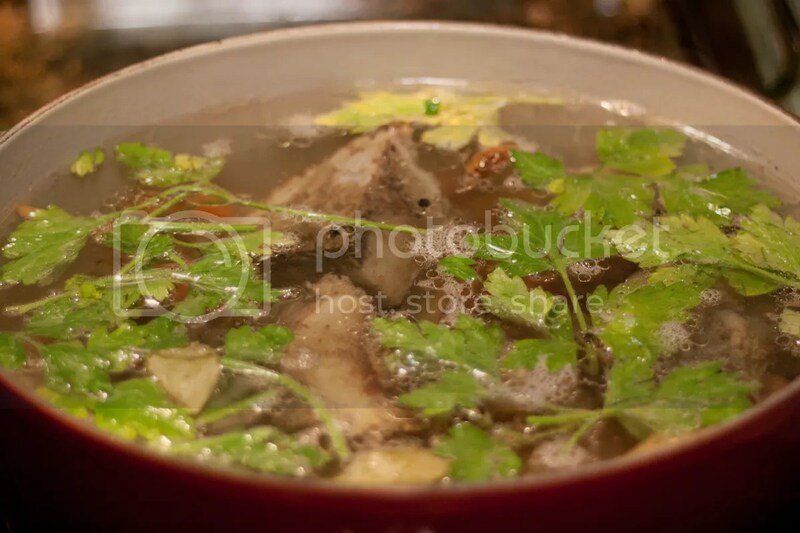 Hi, I used marrow bone for the first time to make stock. I didn’t “pre roast” the bones. Just straight into the water with all the veg. After cooking for 2-3 hrs. It was all oily and unusable! Is this normal? Does roasting get rid of all the fat? I’m making the “marrow bone” stock now, for the 3rd time. Its soooooooooo good and really good for you as well. I recently had an accident were I fell down a flight of stairs in my building. My physical therapist suggested that I drink a cup of the bone stock a day. It has amino acids that are spacificly for the re-building of the tissue around joints and great for joints themselves. So, because of this, I lik the keep all the fat in the soup. BUT, its not for everyone so what I do is after I’m done w the soup, I just put it in the fridge and after a couple of hours the soup separates itself from the oil/fat. I just scrape off the fat when its done. It was nice to come across this sight, so helpful! Thanks, Russ! Have you discussed the issue with pressure cooking with Paul from PHD, experimented and came to any conclusion? And how long it usually takes to extract all of the collagen that isn’t part of the bone? HOW MUCH BROTH DOES THIS RECIPE MAKE? Hi Nancy, just replied to you via email! Just made the Beef Stock from Marrow Bones for the first time :) I have 6 1/2 pints of stock. 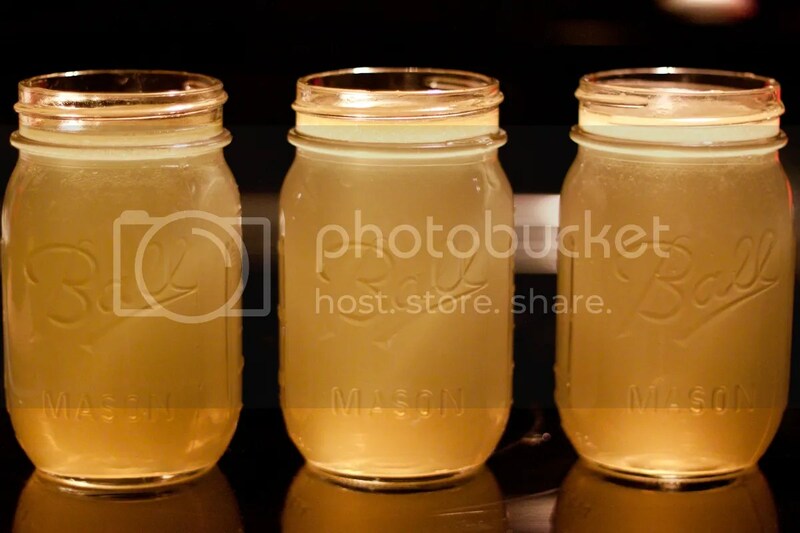 The jar with 1/2 pint is in the fridge for current use, and I boiled the rest in mason jars to seal the jars. The jars are sealed tight, but where should I put them? I suspect I may use 1/2 jar every few weeks, so I have along way to go. 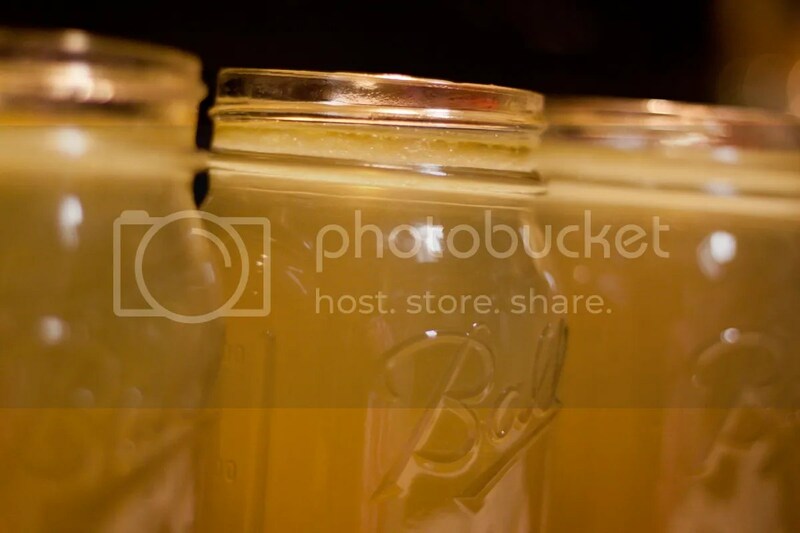 Mason jars are supposed to keep things fresh for a year or so at room temperature, but … is that true for stock? I can freeze them. What do you think is the best way to keep the stock? Hi John, jars containing meat or meat products most definitely won’t keep at room temperature unless you pressure-can them (the method you used is a water bath, which is fine for most other cases). I would freeze the jars, that’s what we do here at the house! Thanks very much Russ. Makes sense. Thank you for this recipe! Have you tried making it in an instant pot (under pressure?) If so, what settings and time would you recommend? I actually also am a little unsure about the slow cooker function on my instant pot, it seems to take much longer than a regular crockpot but will probably try it for a longer period of time.